There are few knives from Japan that are as recognizable as those made by Shosui Takeda. This third generation blacksmith has become recognized as one of the masters in forging blades from the high-quality carbon steel called Aogami Super Steel (AS). His knives are made entirely by hand with his small staff of smiths and craftsmen. 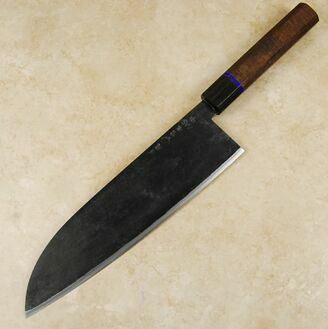 This knife strikes a wonderful balance between stainless steel�s ease of maintenance and carbon steel�s refined grain structure and high hardness. 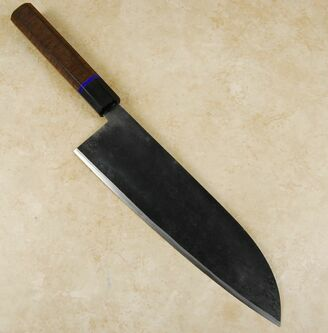 The Takeda AS Stainless Clad Gyuto offers a wonderfully treated core of Aogami Super wrapped in softer stainless steel. 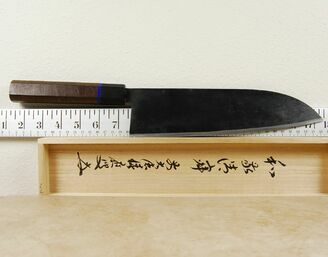 The unique aesthetic character of Mr. Takeda�s knives is highlighted by the beautiful kurouchi finish and oversized blade dimensions, which are exceptionally tall, laser thin, and extremely light for their size. The kurouchi finish on the Takeda Stainless series is noticeably smoother than the Classic line, which helps reduce drag a bit. 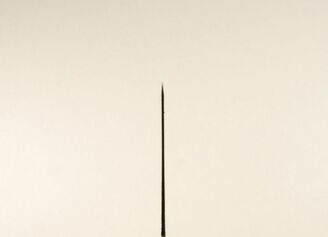 The edge bevel on the 50/50 compound grind runs very tall and ends near the cladding line. These knives take an incredibly acute edge and provide very good edge retention and durability. We are making a limited number of these knives available with some exceptional custom handles made by our favorite woodworkers. We will change the picture and specifications to reflect the currently available package.